The Total Gym Force Home Gym provides over 60 exercise options for a one of a kind full body home gym workout. These exercises target every major muscle group from the pectorals, deltoids and lats in the upper body to your hamstrings, glutes and calves in your lower body. You won’t miss a single muscle group. Total Gym throws in tons of accessories to make sure you can target those muscles perfectly for an intense workout. You get the dip and press up bars for the upper body and the leg pull and squat stand for the lower body. Total Gym also provides the AbCrunch and wing attachments to work your core. If that’s not enough you’ll also get DVDs, an exercise chart, a nutritional plan and a meal plan to get you started. With this great compact home gym – Total Gym FORCE, you’ll get everything you’ll need to start living healthier. 12 calibrated levels for varying resistance. Auto lock height adjustment knob for secure positioning. Padded pillow for extra comfort. Folds for easy storage under a bed or in closet. Includes accessories like the best-selling AbCrunch attachment, wing attachments, leg pull, dip bars, press up bars, squat stand and large stability mat. Also includes an Intermediate Program DVD, Total Body Workout DVD, Total Gym Exercise Flip Chart, Nutritional Program and Meal Plan. Shipping costs will vary for the Total Gym FORCE Home Gym depending on where you purchase from and what type of delivery you prefer. However, some retailers, such as Amazon.com, will provide free shipping. The Total Gym FORCE Home Gym comes out of the box fully assembled. You won’t have to get out your tools or try to follow inadequate assembly instructions. Simply pull the home gym out of the box, unfold it and get to work. When buying a bodyweight resistance home gym, your main priority should be to find a well made, quality machine. The Total Gym FORCE Home Gym is just that. Total Gym is probably the most well known manufacturer for home gyms in this style. That comes with over 40 years of experience. The Total Gym Force Home Gym has a strong, stabile frame design that will keep you balanced and secure in any position. 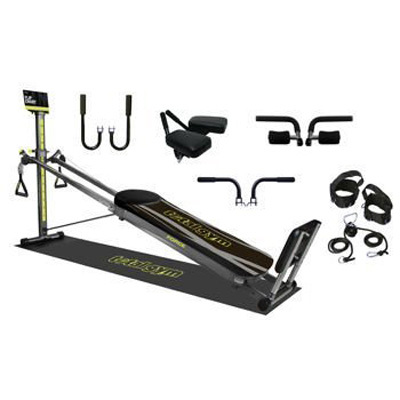 It also has a 350 lb weight limit, which is more than you’ll find in any other home gym at this price point, regardless of the resistance system. When you buy the Total Gym FORCE Home Gym, you’re getting a piece of exercise equipment for life. Another really nice perk with the Total Gym FORCE Home Gym is all of the extras you get. This gym is provides over 60 different exercise options and all of the accessories you need to do them. With your purchase you get the AbCrunch attachment, wing attachments, leg pull, dip bars, press up bars, squat stand and a large stability mat. If you’re unsure how to do these exercises or how to develop a routine, Total Gym also provides material like the Intermediate Program DVD, Total Body Workout DVD and Total Gym Exercise Flip Chart. As a final bonus, you get a complete nutritional program and meal plan to help you meet your fitness goals. The Total Gym Force Home Gym is a really good bodyweight home gym. If you are specifically looking for a home gym with this resistance system, then you can’t go wrong. However, if you’re looking for your best option in this price range, then there may be some better choices. The bodyweight resistance system isn’t the best for building strength. Bodyweight systems are more or less used for burning calories and therefore reducing fat and adding definition. There are a lot of weight stack home gyms in this price range that can help build strength as well as burn calories and add definition. If you’d like to research your options a little closer, take a look at our reviews of the Gold’s Gym XRS 50 or the Weider Home Gym. The Total Gym FORCE Home Gym is an excellent choice for someone looking for a bodyweight home gym. It comes from a reputable manufacturer in the fitness industry and is very well made. It also comes with tons of exercise options and all of the accessories that you’ll need to do them. We don’t really see any big drawbacks on this home gym; only that you may want to research different resistance system home gyms in this price range, because there may be a better option for what you’re trying to accomplish.